Facilities: FCI Fairton with an adjacent minimum security satellite prison camp and a detention center. 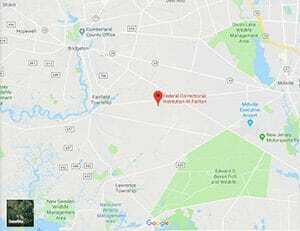 Location: FCI Fairton is located 50 miles southeast of Philadelphia and 40 miles west of Atlantic City, off State Highway 55 at 655 Fairton-Millville Road. Background: FCI Fairton opened in 1990. The satellite camp opened in 1992. Notable inmates include Lucchese crime family member Nicodemo Scarfo, Jr. (serving a 30-year sentence for racketeering, conspiracy, money laundering, and other charges). Housing: Inmates are housed in two-person cells. In the camp inmates live in dormitory-style housing. Health Services: FCI Fairton provides emergency services, dental sick call (for emergency care only, such as toothaches, abscesses, temporary/permanent fillings, etc. ), medical sick call, routine dental treatment, and medications to inmates. While emergency care is available 24 hours a day, inmates must submit triage forms to be evaluated for routine health care needs. Psychology Services: All inmates are screened by a FCI Fairton Psychology Services staff member during their first month at the institution. Some available classes include Anger Management, Stress Management, HIV/AIDS awareness, and Criminal Lifestyles. Certificates are provided for successful program completion. Inmates may also receive brief counseling, individual psychotherapy, and/or group psychotherapy for emotional, behavioral, and familial problems, or for other personal concerns that may arise. Psychology Services coordinates with Health Services in the area of psychiatric coverage. Residential Drug Abuse Program (RDAP): FCI Fairton houses a Residential Drug Abuse Program (RDAP). The camp does not house a Residential Drug Abuse Program (RDAP). The facilities also offer the Drug Abuse Education Class, the Non-Residential Drug Abuse Program (NR-DAP), and self-help programs including Alcoholics Anonymous (AA), Narcotics Anonymous (NA), Thinking Skills, Parenting and Recovery, Nicotine Anonymous, Anger and Recovery, and Living Free. Education Services: FCI Fairton and the camp provide GED and English-as-a-Second Language (ESL) programs. Social education (Pre-Release Program) and career counseling are also available. High school diplomas and post-secondary programs are available through paid correspondence programs. Advanced Occupational Education: FCI Fairton offers advanced occupational education in Aquaculture and Horticulture. The camp does not offer any advanced occupational education programs. Vocational Training: No vocational training is offered at FCI Fairton or the camp aside from the vocational training and apprenticeship programs. Apprenticeship: FCI Fairton offers apprenticeships in Electrician, Gardener, HVAC, Landscape Management Technician, Landscape Technician, Plumber, Quality Assurer, and Building Maintenance Apprenticeship. The camp offers an apprenticeship in Dog Trainer for Hearing Impaired. Library Services: The FCI Fairton education library is designed to support leisure reading, independent study, and academic programs. Resources include printed materials in various forms, as well as audiotapes, videotapes, listening laboratory media/study kits, reference materials, and a computer laboratory. The law library provides inmates with access to legal research materials. This is primarily accomplished through the TRULINCS Electronic Law Library. Inmates also have access to a copy machine and electronic typewriters. UNICOR: The FCI Fairton UNICOR facility produces electronics and plastics. Commissary: Inmates are permitted to spend up to $360.00 each month for all purchases. The only items that are excluded from this spending limitation are stamps, phone credits, copy cards, over-the-counter medications, and computer/TRULINCS units. The total value of an inmate’s accumulated commissary items (excluding special purchases) is limited to the respective monthly spending limit. Inmates tend to use their laundry bags to carry their commissary purchases. Recreation Services: Leisure and recreation programs at FCI Fairton include indoor and outdoor activities ranging from individualized arts and crafts programs to intramural team sports, such as softball, basketball, volleyball, and others. Physical fitness and weight reduction programs are also offered.